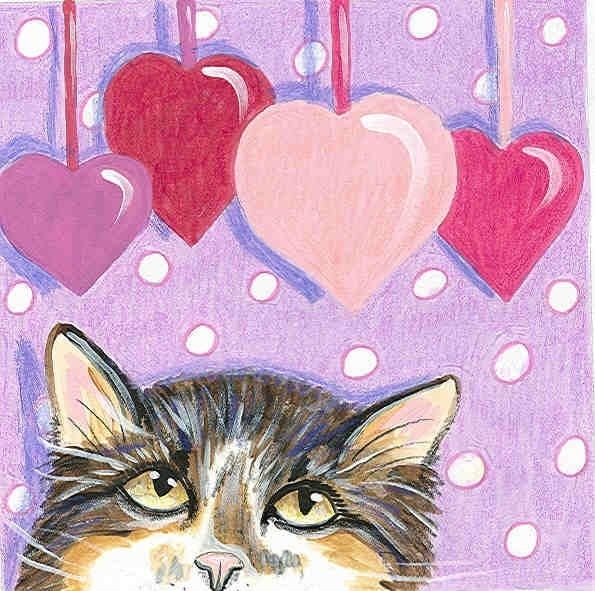 This little kitty is playfully peeking above the edge of the card to tell you how she feels! Each notecard measures 4 1/2 x5" and comes with a white envelope in a protective cello sleeve. They're left blank for your own personal message. I have added glitter for that extra bling! Your cards are magnificent!!!! The colors and artwork are really beautiful and different. I just love them and I am so glad I ordered several. Plan on looking for more. Thank you!!!! Top top quality & service! What wonderful, whimsical art you create.........thanks for making the planet more fun!